Pastor Jim Poyner, left, will pass the reins of the church he “planted” to son Paul Poyner. The retirement of Grace Brethren pastor, Jim Poyner, is the topic of a story in yesterday’s Tampa Bay Times. He planted the Gulfview Grace Brethren Church in Port Richey, Fla., and continued to serve as its pastor for 33 years. A portion of the story appears below. Click here to read the complete article. PORT RICHEY — The walls in the Rev. Jim Poyner’s office at Gulfview Grace Brethren Church are bare and prepared for fresh paint. The renovation is evidence of transition — almost a metaphor, said his son, Paul, for the big change ahead for both of them. 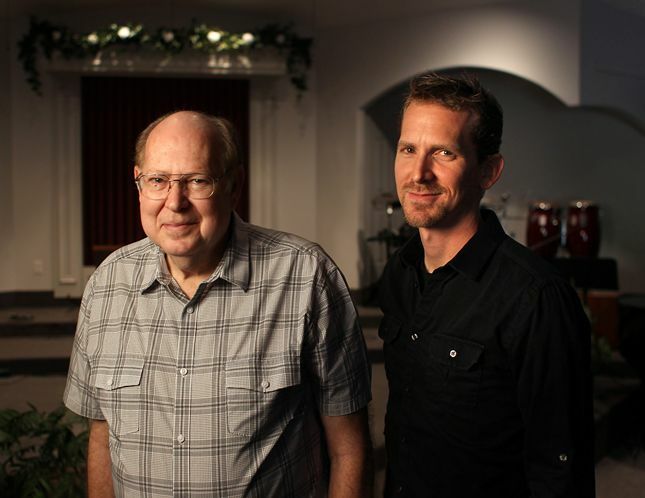 After 33 years as the church’s pastor, Jim Poyner will retire Dec. 7 and his son will replace him. “There’s a time to accept a church, and there’s another time to realize I’ve slowed down,” said Jim, 70. He realized his limitations on Valentine’s Day this year after a surgeon implanted a pacemaker and defibrillator in his chest.